After a great deal of speculation and rumours, the new, 2018 iPhones have been released. One of the biggest surprises this year, was the news of how much they cost, with prices ranging from $1,229 to $2,369 Australian. Buying an iPhone isn’t meant to be a family budget decision – people buy iPhones for the look, features, quality and innovation that are an integral part of the Apple brand. That appears to mean that they are prepared pay more as a result – meaning that Apple can afford to charge high prices. This year’s iPhone release has seen three new products join the iPhone family, and many consumers have already formed opinions about the devices. This year WhatPhone, Australia’s largest mobile only comparison site, conducted their annual research to find out what consumers think about the newest Apple products to hit the market, and we break down what that means for you. The 2018 WhatPhone / iPhone Survey. 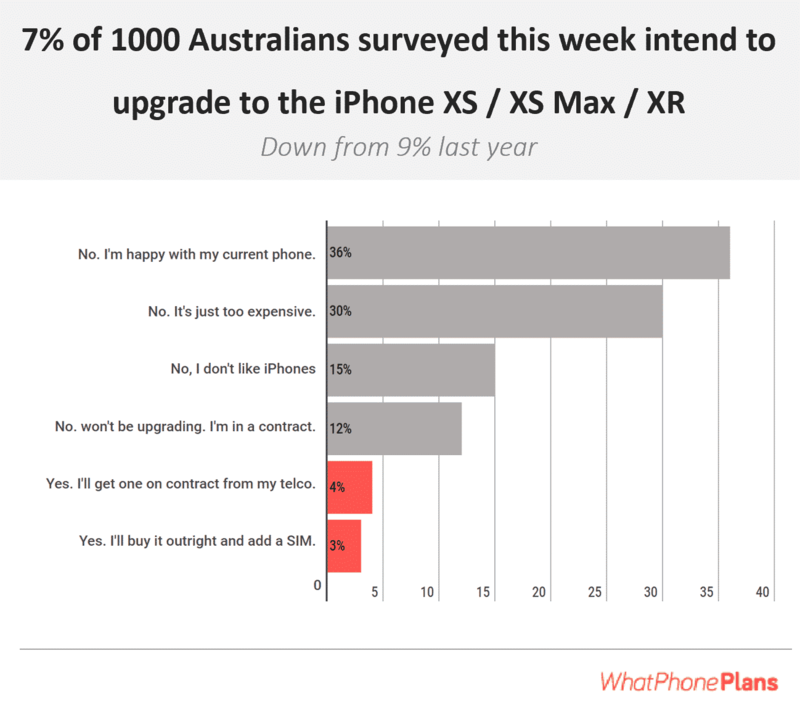 WhatPhone conducted an online survey that gathered responses from 1,000 Australians about their opinions on the newest iPhones about to be released. This original research was conducted between the 15th and the 17th of September this year, just a few days after the new models were announced on September 12th. The survey was designed to gather data on consumer reactions to the new models, whether they intended to acquire one of the latest iPhones, and what features an accompanying mobile plan might need to have to complement their new device. 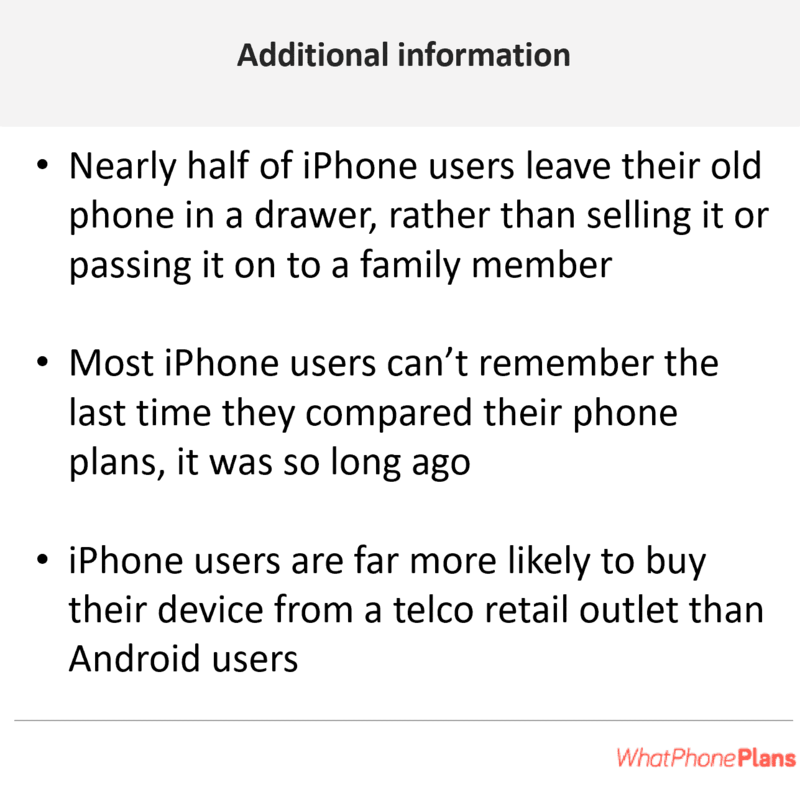 From the population surveyed, only 7% planned to upgrade to one of the new devices – either the iPhone Xs, Xs Max or Xʀ. This is a similar result to last year ( in our research at that time, 9% of people said they would upgrade) and represents a significant number of customers– surprising given the increased cost of the 2018 iPhone range. However, given that Apple were disappointed with sales of their iPhone X range last year, the fact that this year’s numbers could be even lower might mean bad news for Apple stock holders! 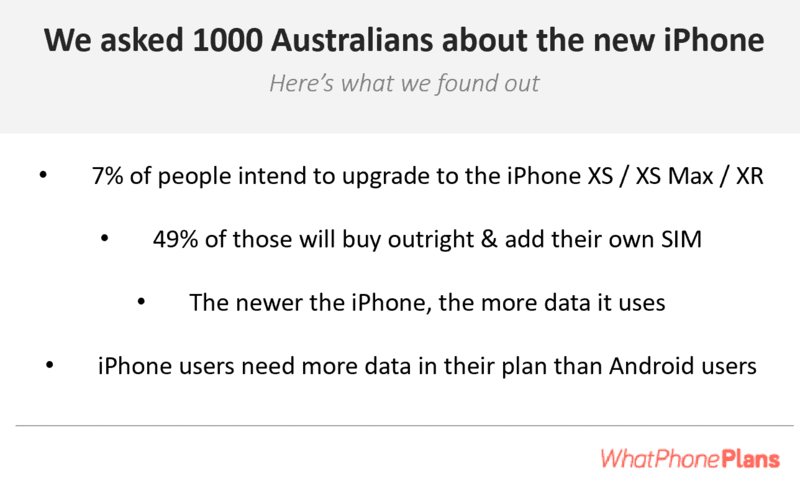 7% of Australians intend to upgrade their iPhone this year. The smartphone market is nearing saturation. Everyone who wants a smartphone already has one. That mostly leaves young people, who are reaching an age where they buy their first smart phone as the only market Apple can grow in to. Realistically, most young people are unlikely to receive the latest iPhone as their first phone – or be able to buy it themselves. Almost everyone else will have a working device that they are looking to upgrade from, for personal reasons. (Typically to have the latest phone and to fix a battery problem that they have with their previous device) The fact that these devices will mostly be purchased as an upgrade makes the high level of interest despite the expensive prices even more remarkable. After deciding to upgrade to a new iPhone, customers need to decide whether to buy them outright, or pay them off over time as part of a post-paid contracted plan. There is a range of pros and cons for each option, depending on the customer’s needs and financial situation. 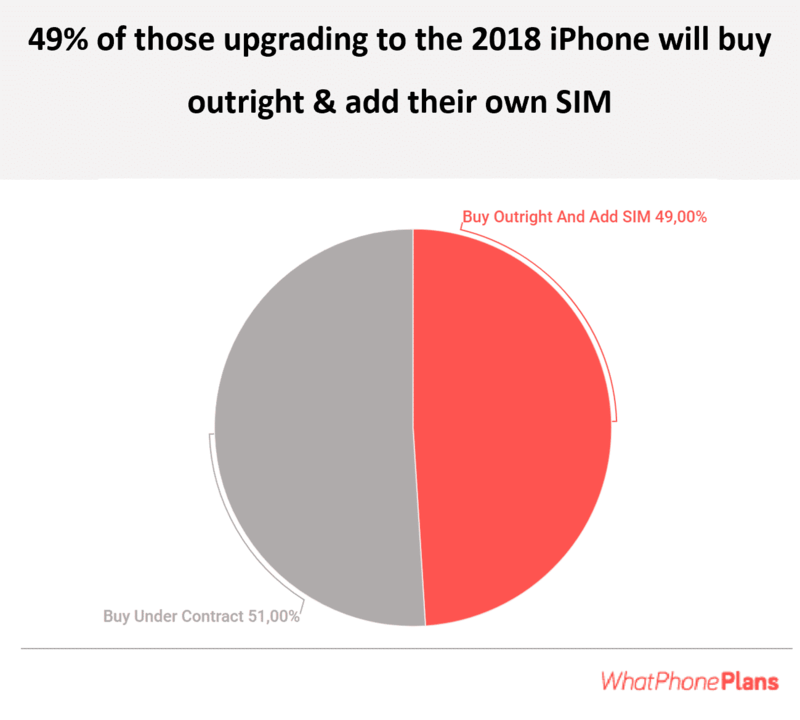 49% of people intend to upgrade their iPhone and add a SIM themselves. A surprising 49% of those surveyed said they would buy their phone outright and add their own SIM. The number is remarkable because of the significantly increased cost of the most recent devices. Last year’s flagship model, the iPhone X, only achieved relatively low sales which was mostly due to customers preferring to purchase older models at a cheaper price. Undeterred, Apple has set prices this year even higher. While many people choose a plan because they are simply not able to afford the cost of a new iPhone outright, others think that the plan offers them a better deal. The truth is that over the life of the plan, most customers will end up paying more for their phone. They are also “locked in” to a contract that may not offer the best deal, and be unable to choose new offers that come up over the 24 months of their contract that provide better value. That’s especially important considering the increased data needs of each new model mean iPhone users need as much data as possible, preferably as cheaply as possible. The most important question : iPhone Data. If you’re getting an iPhone Xs / Xs Max / Xʀ this year, we recommend a plan with at least 6GB of data in it. The newer the iPhone, the more data it gets through. The newer the iPhone, the more data it uses. Bigger screens and faster processors increase data usage, and each year the iPhone gets a sizeable upgrade in these areas. As the capabilities of the phones increase, consumers are using their phones for more and more everyday tasks requiring data. But the amount of data required is not consistent across brands – iPhone users report needing more data than their Android counterparts, with most having a plan that offers more than 6GB of data a month. 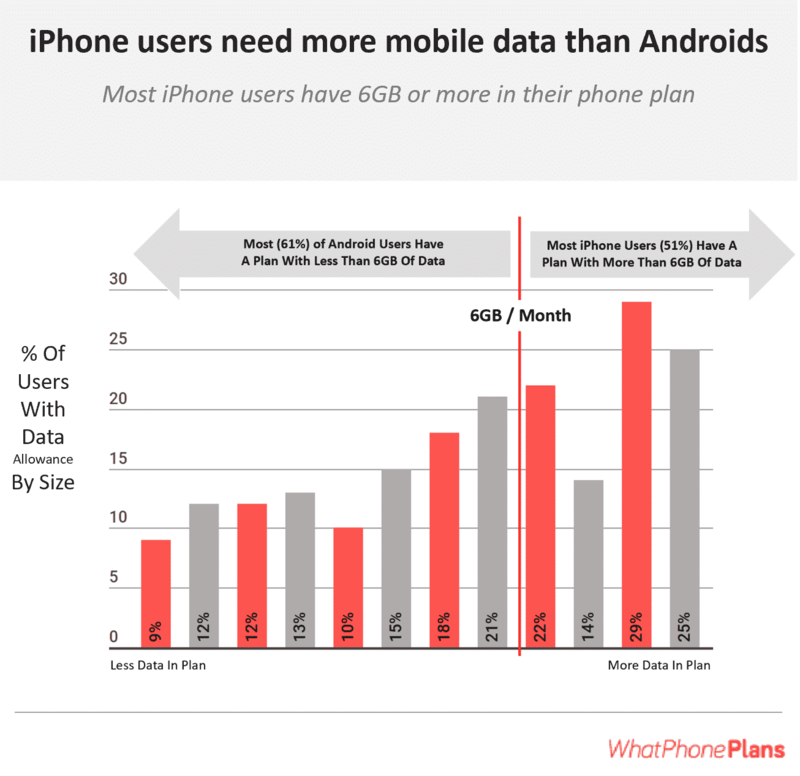 More than 50% of iPhone users have a plan with 11GB of more mobile data in it. More than 60% of Android users have a plan with less than 11GB of mobile data. Data use is significant because most of the larger companies offering iPhones on a contract do not have the best deals for data – generally offering expensive plans with less inclusions and fewer extra features like data banking that smaller companies offer. That adds to the increased price over time of opting for a phone as part of a contract instead of buying outright and being free to choose a company that offers the best deals (especially for data) and to swap companies later on if an even better deal comes up. What do people do with their old iPhone? When it’s time to upgrade, nearly half of iPhone users leave their old phone in a drawer rather than selling it or passing it on to a family member. That’s great for Apple, who presumably end up with more customers buying devices brand new with fewer second-hand options available. When it comes time to purchase a new iPhone, users are far more likely to buy their device from a telco retail outlet than Android users. That probably points to a lack of time spent researching different prices and options, as shopping at a retail outlet isn’t necessarily the best way to find the lowest prices. It has been sol long since people checked their iPhone plan inclusions against the competition, people can’t even remember when they did it. That lack of desire to shop around showed in other areas of our research. Most iPhone users said they couldn’t remember the last time they compared their phone plans, because it was so long ago. Phone plans offer a wide variety of inclusions and price points, so taking time to research can definitely pay off, especially over time. Getting a plan that includes the latest iPhone limits the number of options to choose from, but is still worth some research. Sites like ours are dedicated to taking the work out of the process, making it easy to get the best deal for each customer’s needs and budget. 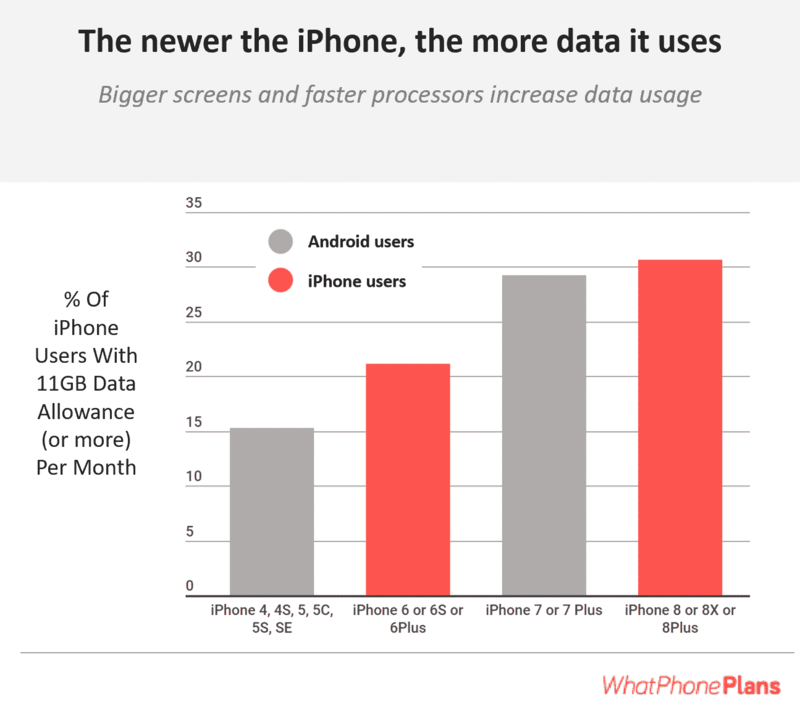 WhatPhone’s research indicates that the newest iPhones will prove popular, but consumers will need more data than ever before. Buying a new iPhone is an exciting purchase, but the cost warrants the extra time spent to get the highest data inclusions possible for the lowest price. Finding the best deal for your circumstances will allow you to get the most out of your new device – just the way Apple intended. 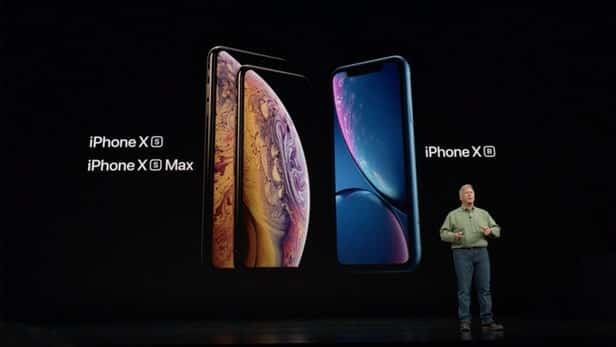 There are 3 new iPhone devices available in the 2018 range, the iPhone Xs, Xs Max and iPhone Xʀ. The Xs and Xs Max are a step up from last year’s model, but without any drastic changes. They include a notch, edge-to-edge OLED display and stainless steel – all similar to the iPhone X. The Xs and Xs Max will have OLED Super Retina displays of 5.8-inch and 6.5-inch respectively, which makes the Xs Max the biggest smartphone screen ever made by Apple. Both the Xs and Xs Max will feature a dual SIM, (one of which is an eSIM slot) which allows users to have two different numbers on the same phone. They will come in silver, space grey and a new gold finish. The glass has received an upgrade to become more durable. The phones will be available with 64GB, 256GB and 512GB of internal storage. The Xs and Xs Max include a A12 bionic chip, making the CPU up to 15% faster and 40% more power efficient than its predecessor, along with a GPU that’s up to 50% faster. The batteries offer a significantly longer battery life when compared to the previous model. The new devices will also include a better camera, faster FaceID and many other iOS 12 features (which will go live on September 17) including live facial tracking for Animoji, ARkit 2 and Siri Shortcuts. The iPhone Xʀ is the realisation of the rumoured cheaper third iPhone, although with prices starting at $1,229 it’s still not exactly a budget option. It offers a 6.1-Inch Liquid Retina LCD display and an aluminium body available in white, black, blue, yellow, coral and red. It’s not as basic as some people predicted, with Apple managing to include edge-to-edge display, Face ID, A12 bionic chip, an improved camera, haptic touch, more durable glass (as featured in the Xs and Xs Max) and an IP67 splash and water-resistant rating. The Xʀ will come with the option of 64GB, 128GB and 256GB of internal storage, while Apple claims the battery will last up to 90 minutes longer than the 8 Plus.